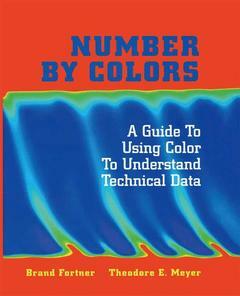 Number by colors : a guide to using color to understand technical data Fortner Brand, Meyer Theodore E.
Auteurs : Fortner Brand, Meyer Theodore E.
Tutorial in nature, this book contains many practical examples in the text. The first section of the book discusses colour physics, physiology and psychology, including details of the eye, the visual pathway, and perception of hues, whilst the second section explains colour technologies. I: Color Physics, Physiology, Psychology.- 1 Spectral Analysis.- Introduction—Spectral Analysis.- Questions About Spectral Analysis.- Generating Waves.- Constructing a Harmonic Oscillator.- Sine Waves.- Waves in Space.- Sound Waves.- Analyzing Waves.- Power Spectra.- Calculating Power Spectra.- Light waves.- Electromagnetic Radiation.- Photons.- Light Definitions.- Summary—Spectral Analysis.- Responses to Questions About Spectral Analysis.- References.- 2 Eye, Ear, and Brain.- Introduction—Eye, Ear, and Brain.- Questions About Eye, Ear, and Brain.- The Ear—Sensing Sound.- The Physiology of the Ear.- The Five Dimensions of Sound.- The 3D + S +t Field.- The Spatial (X,Y) Dimensions.- The Depth (Z) Dimension.- The Sound Dimension.- The Time (t) Dimension.- The Ear—Summary.- The Eye—Sensing Light.- Sensing Light.- The Physiology of the Eye.- The Parts of the Eye.- The Photosensors: Rods and Cones.- The Visual Pathway and the Lateral Geniculate Nucleus.- The Five Dimensions of Light.- The 3D + C + t Field.- The Spatial (X,Y) Dimensions.- The Depth (Z) Dimension.- The Time (t) Dimension.- The Light Dimension.- Summary—The Eye and the Brain.- Responses to Questions About Eye, Ear, and Brain.- References.- 3 Light Spectra to RGB.- Introduction—Light Spectra to RGB.- Questions About Light Spectra to RGB.- Sensing the Light Spectra.- Sensing Reflected Light.- Color Constancy.- Colorblindness.- Summary—Light Spectra to RGB.- Responses to Questions About Light Spectra to RGB.- References.- 4 Hue, Saturation, Intensity.- Introduction—Hue, Saturation, Intensity.- Questions About Hue, Saturation, Intensity.- Dueling Theories of Color Perception.- The Young-Helmholtz Theory.- The Herring Theory.- The Modern Synthesis.- Defining Hue, Saturation, Intensity.- Intensity.- Intensity, Brightness, Reflectivity.- Perception Versus Physics.- Old Movies.- Hue.- Saturation.- A Laser and Floodlight.- Non-Rainbow Colors.- A Missing Pure Hue.- Brown.- Color Temperature.- When RGB, When HSI?.- Producing Colors in RGB.- Describing Colors in HSI.- Summary—Defining Colors.- Responses to Questions About Hue, Saturation, Intensity.- References.- II: Color Technology.- 5 Defining Colors—The CIE Color Diagram.- Introduction—The CIE Color Diagram.- Questions for Defining Colors—The CIE Color Diagram.- From Three Dimensions to Two.- The Color Cube.- The Color Circle and Color Triangle.- Selecting the Primary Colors.- Response Curves for Color Cube.- Light Spectra for Color Cube.- The CIE 1931 Diagram.- Why X,Y,Z?.- CIE 1976.- Describing and Mixing Colors on the CIE.- Describing Colors on the CIE.- Mixing Colors on the CIE.- Primary Colors on the CIE.- More Adventures on the CIE.- White Points.- Colorblindness.- What about Intensity?.- What the CIE Cannot Do.- Reproducing the CIE.- Summary.- Responses to Questions for the CIE Color Diagram.- References.- 6 Defining Colors—Color Models.- Introduction—Defining Colors—Color Models.- Questions for Color Models.- Additive Versus Subtractive Color Models.- Two Greens Make a Green.- Two Greens Make a Black.- Cyan and Yellow Make Green.- Making Pink.- Further Adventures of Subtractive Color.- Complementary Colors and the Color Circle.- Why White and Red make Pink.- Subtractive Colors on the CIE.- Subtractive Primaries.- The Color Models.- The RGB Color Model.- The CMY and CMYK Color Models.- The RYB Color Model.- The YIQ Color Model.- The HSI, HSV, HSB, and HLS Color Models.- Summary.- Responses to Questions.- References.- 7 Reproducing Colors—Fundamentals.- Introduction—Reproducing Colors.- Questions About Reproducing Colors—Fundamentals.- Pixels.- Pixels and Dots per Inch.- Rectangular Pixels.- Resolutions.- Continuous Versus Discrete.- Spatial and Intensity Resolutions.- Gamma Correction.- The Need for Gamma Correction.- Other Uses for Gamma Correction.- Halftones.- What is a Halftone?.- Making a Halftone.- Lines per Inch and Dots per Inch.- Digital Halftones.- Making Digital Halftones.- How Many Intensities?.- Clustered Dot Dithering.- Clustered Dot Dither.- The Dither Matrix.- Single Pixel Dithering.- Two Methods of One Pixel per Dot.- Ordered Dither.- Error Diffusion.- Summary.- Response to Questions.- References.- 8 Reproducing Colors—Technologies.- Introduction—Reproducing Colors—Technologies.- Questions About Reproducing Colors: Technologies.- Photography.- Black&White Photography.- Color Photography.- Maintaining Color Balance.- The Photographic Standard.- Printing Presses, Halftones, and Process Color.- Letterpress Printing.- Offset Printing.- Comparing Letterpress to Offset.- Photographic Halftones.- Color Printing.- Process Color Versus Spot Color.- Duotones.- Computer Monitors, Video, and Television.- The Prehistory of Television.- Cathode Ray Tubes.- Color Television.- Television Standards.- Interlacing and Future Television Standards.- Video Standards.- Computer Monitors.- The Shape of Video Pixels.- Gamut and Resolution of Monitors.- Computer Printers, Copiers, and Fax Machines.- Impact Printers.- InkJet Printers.- Thermal Printers.- Electrostatic (Laser) Printers.- Phototypesetters.- Thermal Dye Diffusion.- Summary.- Answers to Questions About Reproducing Colors: Technologies.- References.- III: Color on Computers.- 9 Numbers in Computers.- Introduction—Numbers in Computers.- Questions About Numbers in Computers.- Bits, Bytes, and Signs.- Unsigned Bytes.- Signed Bytes.- Hexadecimal Representations.- Integers and Fixed-Point Numbers.- Short Integers and Long Integers.- Fixed-Point Numbers.- Working with Integers and Fixed-Point Numbers.- Range of Values Considerations.- Truncation Error.- Byte Order.- Floating-Point Numbers.- Single-Precision Floating-Point Numbers.- Single-Precision Floating-Point Range of Values.- Single-Precision Floating-Point Numerical Precision.- Double-Precision Floating-Point Numbers.- ASCII Text Numbers.- ASCII Characters.- ASCII Text Strings.- ASCII Numbers.- ASCII Delimiters.- Storing a Position but Not a Number.- Fixed Format Delimited Files.- ASCII Line Separators.- Working with ASCII Text Numbers.- Computational Resources.- Range of Values.- Numerical Precision.- The Data Universe.- Data Values, Locations, and Dimensions.- Defining Data Location.- The Dimensionality of Data.- Adding a Dimension.- Organizing Data Storage.- Column Data.- 2D Matrix Data.- 3D Matrix Data.- Polygonal Data.- Summary—Numbers in Computers.- Responses to Questions About Numbers in Computers.- References.- 10 Color in Computers—Fundamentals.- Introduction—Color in Computers—Fundamentals.- Questions About Color in Computers—Fundamentals.- Color, True Color, Index Color.- Color in Computers.- The 24-Bit RGB Way.- Problems with RGB.- True Color Images.- Interleaving.- Index Color Images.- Index Color and Colortables.- Problems with Index Color.- Colortables.- System Colortables.- What is a System Colortable?.- System Colortables and Image Colortables.- Remapping Colortables.- A Remapping Example.- Making the Closest Match.- Problems with the Closest Match.- Creating Optimum Colortables.- Constructing an Optimum System Colortable.- Constructing an Optimum Image Colortable.- Shrinking a Colortable.- Summary.- Answers to Questions About Color in Computers—Fundamentals.- References.- 11 Color by Numbers—Using Color to Visualize Data.- Introduction—Color by Numbers.- Questions About Color by Numbers.- Visualizing 2D Arrays as Grayscale Images.- Converting Numbers to Grays.- Using Index Color.- Modifying the Colortable.- An Alternate Method.- Comparison to Gamma Correction Factor.- Pseudocolor and False Color Images.- Pseudocolor Images.- Replacing Grayscale with Pseudocolor.- The Problems of Pseudocolor.- Pseudocolor Images Versus Color Images.- False Color Images.- Putting It All Together—Color Guidelines.- Color Rules to Live By.- To Color or Not to Color.- Choosing Colors.- Choosing Color Combinations.- Technological Considerations.- Creating Pseudocolor Tables.- Why Images Need Lots of Colors.- Pseudocolor Issues.- Choosing a Pseudocolor Colortable.- Pseudocolor Colortable Examples.- Summary—Color by Numbers.- Responses to Questions About Color by Numbers.- References.- Appendix A Science and Graphics Data Formats.- Introduction—Science and Graphics Data Formats.- Questions About Science and Graphics Data Formats.- Graphics Formats.- Home Growing a Bitmap File Format.- Home Growing a Vector File Format.- Bitmap Graphics Formats Versus Vector Graphics Formats.- Scientific Data Formats.- Annotations.- Data Organization.- Organizational Concepts.- Summaries of Selected Graphics and Scientific Data Formats.- Summary—Science and Graphics Data Formats.- Responses to Questions About Science and Graphics Data Formats.- References.